You're looking for a good time, day or night, and you don't want to over think things - you want great food with awesome friends at a convenient location. 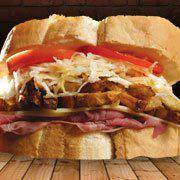 Primanti Bros. works hard to provide you with that good time - strategically placed so that you're never far from unwinding with your best friends or having a snack with the family. Watch your favorite sporting event !! !